Romantics search the sky for shooting stars to make wishes on... and realists keep an eye out for satellites. But who can tell if what you spy in the nightly sky is a shooting star, a satellite, an airplane, a UFO, or something else? Perhaps Satellite AR can help you answer that question. As the AR part of the name suggests, Satellite AR is an app from the so-called “Augmented Reality” field. We like anything that augments reality, so we decided to take a closer look. 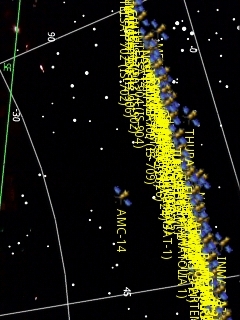 Satellite AR adds information regarding satellites to your device’s display—satellites which you should – theoretically – be able to see at a given position in the sky, be it with your own eyes or with the help of a telescope. Yes, there are a few satellites which we should be able to make out with only our eyes, but they often escape us because we don’t know where to look for them. 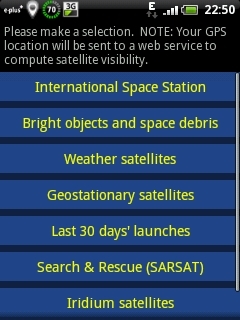 After you start off the app you will be able to see a selection of satellites which can be displayed on your device (first screenshot). Why can’t you see ALL the satellites out there? The answer lies in the second screenshot: only geo-stationary satellites are shown. And, you guessed it, the yellow strip isn’t actually a strip, it’s just the space where all the names overlap. The weather satellites are a lot easier to make out, but unfortunately all the wild action (camera image, AR-layer, background data, live updates, and screenshot) was too much for my poor Wildfire, and as a result the screenshots turned out to be unusable. Satellite AR’s design is well thought-out. The list of satellites (almost) fits onto the Wildfire screen, and figuring out how to use the app is elementary. 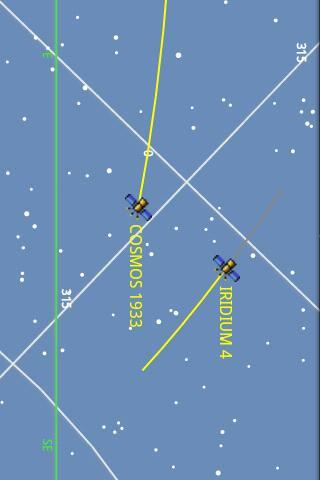 The fact that not all the information – such as the names of geo-stationary satellites – can be shown simultaneously AND always be perfectly legible can’t be held against the app. 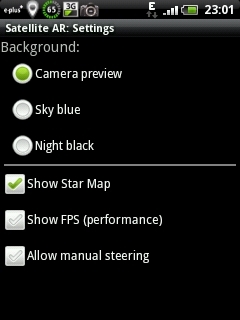 Configuration is also pretty basic and also fits onto the display. You probably won’t want to make any changes anyway, seeing as the standard settings are okay. If you have a device that can cope with even less than my Wildfire you do have the option of switching the camera off, for e.g., and selecting a monochrome background. If you want to know how fast your phone can process images you can display the Frames per Second. Both speed and stability were pretty good. The app didn’t crash one single time, and all in all Satellite AR performance was good. There was some lagging when I was loading large data packages (i.e. details regarding the geo-stationary satellites). This may also be linked to network connection. You can download Satellite AR for free from the Market.